Yes, a green sriracha sauce called Midori Sriracha and a Japanese Spicy Mayo are now available in the US. 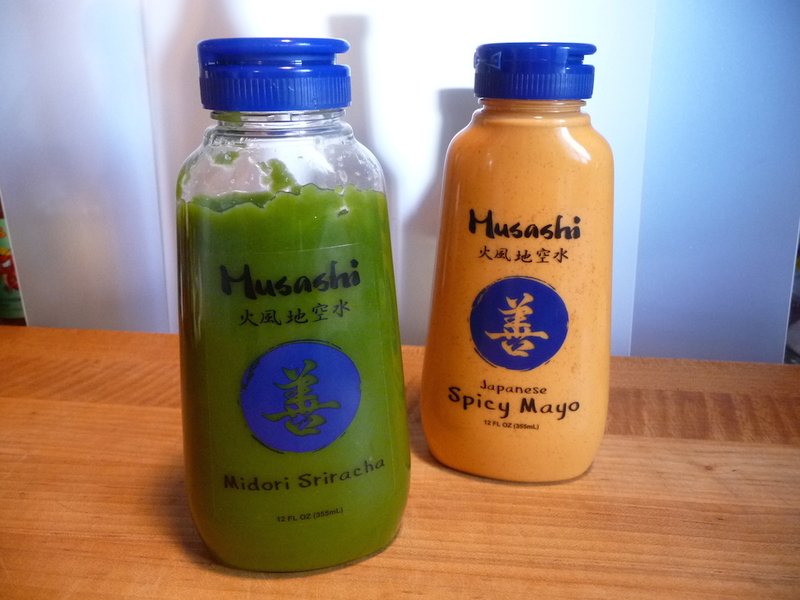 A few bottles of Midori Sriracha and Japanese Spicy Mayo arrived at HotSauceDaily headquarters recently. What in the world? Green sriracha? What will we do with these? 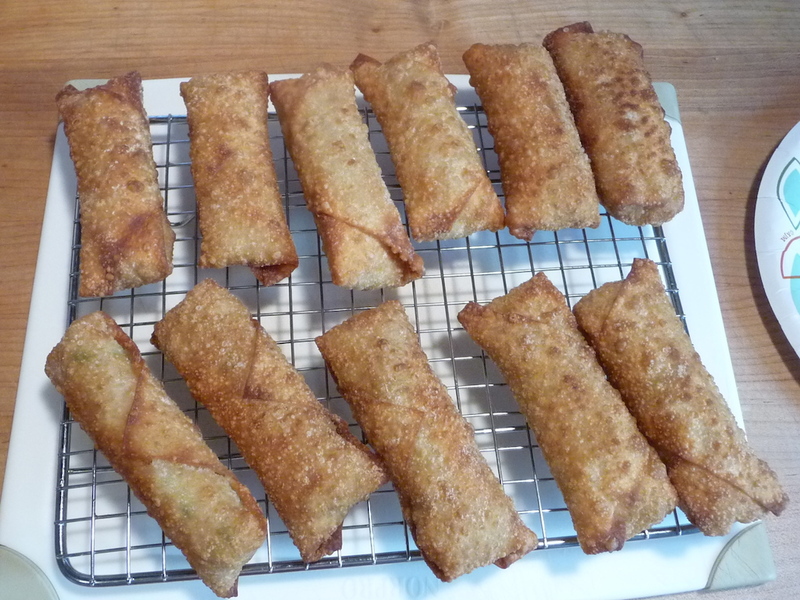 Egg rolls to the rescue! 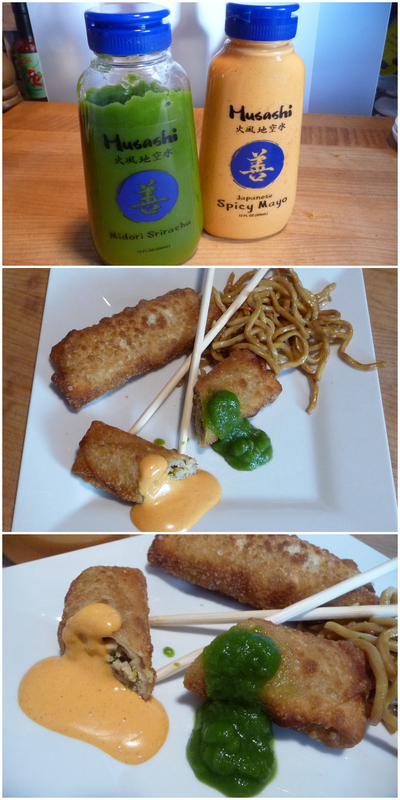 Marilyn cooked up a batch of her homemade egg rolls (from scratch), and along with some veggie lo mein, we had ourselves a spicy brunch with Musashi’s new sauces. It’s weird to see a thick and saucy green sriracha that tastes for all the world just like sriracha! Oh, there are unique aspects of the flavor – we’ll get into that shortly. Texture & Appearance: Thick and very green – almost a perfect consistency for any application. Taste Straight Up: The vinegar hit is pretty strong here. Next up is the heat and burn from serranos – a bit sharper in profile than your usual “red” sriracha sauces. Heat Level: – Overall, fairly tame in heat compared to the venerable “rooster sauce” of Huy Fong. I would even say a bit milder than the other new kid on the block, Texas Pete’s CHA!. Overall Rating: – I give this 4 stars for effort. Maybe if the garlic were a bigger flavor here I’d go higher. Also, there’s the bright green color that my brain thinks “wasabi” or a bigger olfactory hit of heat and burn. It just occurred to me that this is a perfect “starter” sauce for sriracha newbies. Wife or hubby not into the heat of Huy Fong’s Rooster sauce? 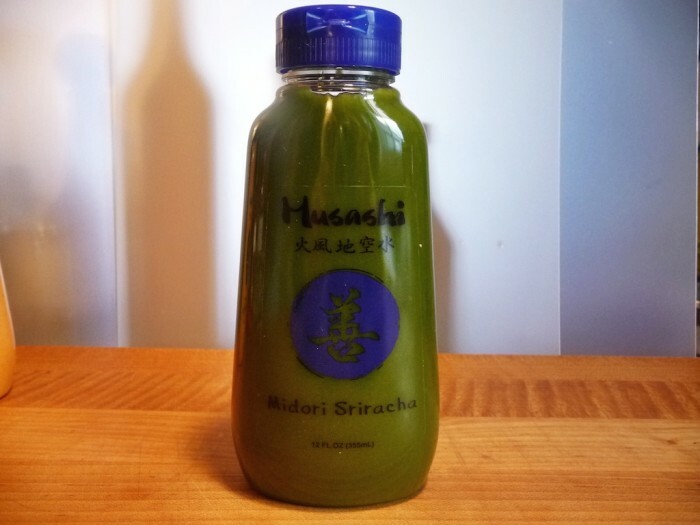 Have them try Musashi’s Midori Sriracha and I bet you get them converted. We dipped some delicious egg rolls into the Midori Sriracha for our taste test. I preferred the Midori Sriracha over the Japanese Spicy Mayo, whereas Marilyn preferred the Mayo. Go figure, different tastes for different folks! As I said, this might just be the perfect sriracha sauce to get your significant other to like sriracha. Also, I can imagine this sauce as a great base for sriracha wings. I did not know what to expect from this sauce. Wow! What a big, sharp hit of heat – right to the back of the throat. This creamy, thin sauce packs some punch. Ingredients: mayonnaise (soybean oil, water, eggs, vinegar, sugar, salt, mustard flour, spices and EDTA (preservative)), water, red serrano peppers, vinegar, garlic, sugar, sesame oil, xanthan gum, sodium benzoate (preservative), potassium sorbate (preservative). Texture & Appearance: Very thin and runny. It looks just like a thin deli style mustard with its muted color and flecks of spices. Taste Straight Up: This smooth mayo sauce brings with it a sharp, back of the throat hit of heat. This is not a timid sauce. It’s also not a killer sauce… most anyone should be able to handle it. 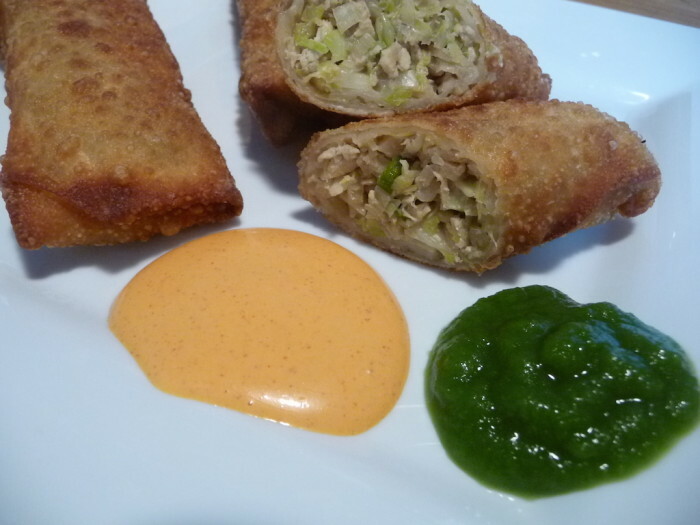 Heat Level: – Just a tad above average in heat, the thin, spicy mayo from Musashi will hit you in the throat with the serrano peppers – this time they’re red serranos. Interesting! Overall Rating: – I can’t get past the thin consistency (nowhere near a mayo thickness) and saucy appearance. 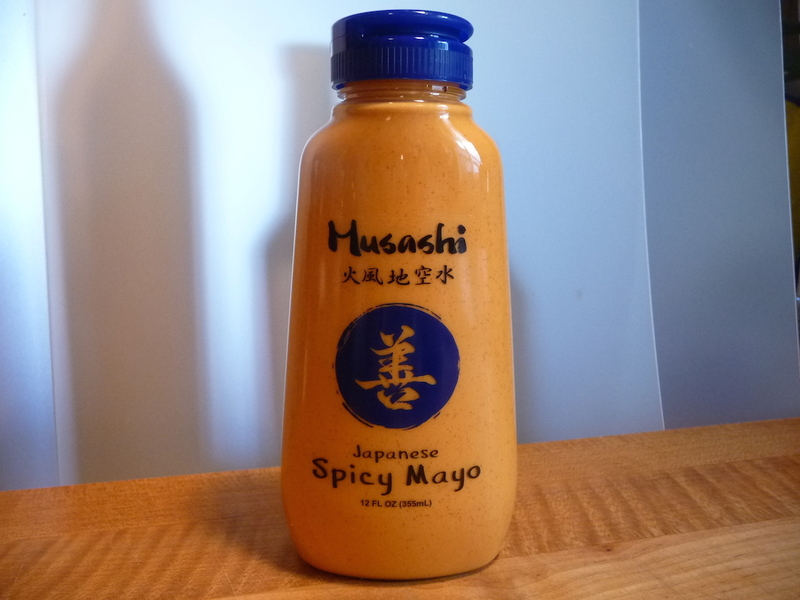 Mayo is mayo, and if you are going to create your version of a spicy mayo, it should be thicker. In my opinion. 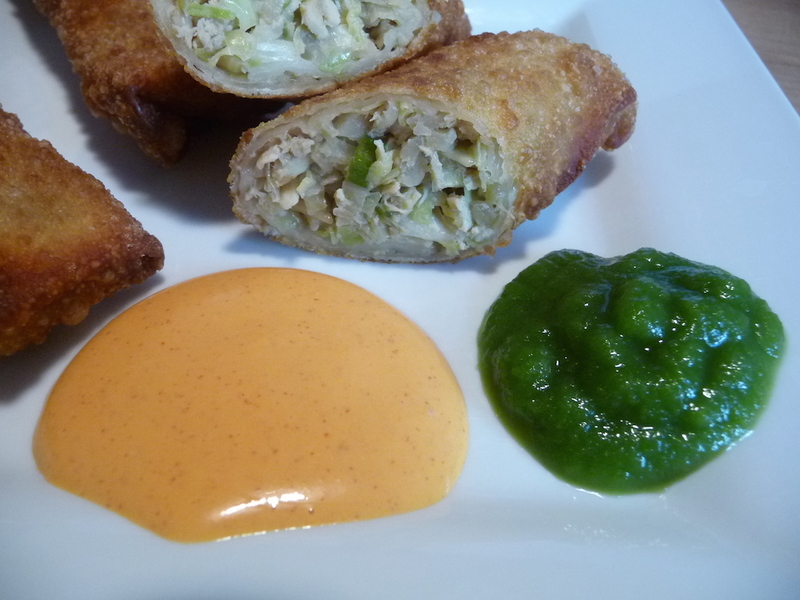 Marilyn loved this on her egg rolls – even more than the Midori Sriracha. I was the opposite. Marilyn had a half dozen suggestions for this sauce – deviled eggs, sandwiches, egg salad… pretty much anything you’d put mayo into. Are you up for a green sriracha sauce? 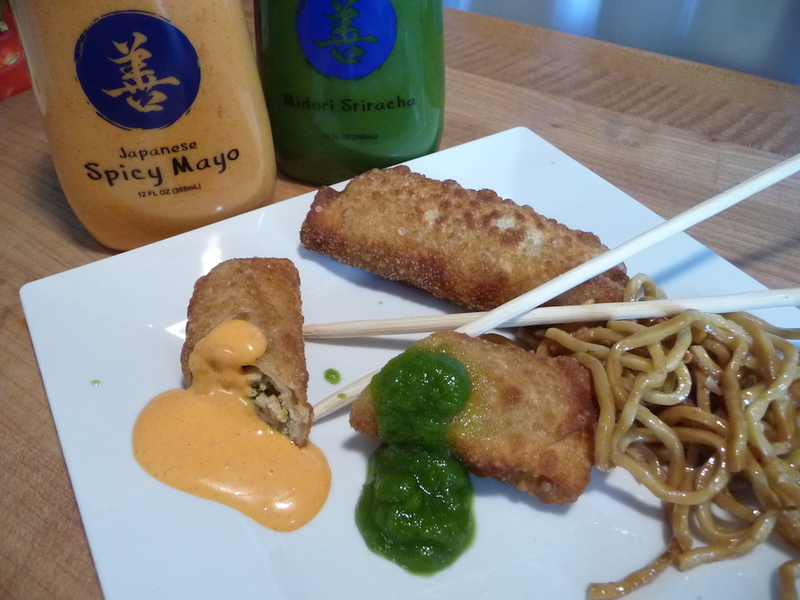 Or a spicy mayo with Japanese overtones? Leave a Comment below and let us know.